Maharṣi Vasiṣṭha defines a flaw called ‘Abhukta Mūla’ for these three junctions and any child born during the 180 minutes when the Moon is at these junctions. Period of 90 minutes is one Kāla (as in kālachakra) at the end of Aśleṣā, Jyeṣṭha and Revatī and 90 minutes at the start of Maghā, Mūla and Aśvinī is to be treated as Abhukta Mūla doṣa. The word Abhukta implies (a) uneaten as in fasting or being denied food for sustenance, (b) unenjoyed or unused as in abstinence indicating one who is neither a source of joy nor of any use to the world (society). It shows one who is like an unexpended unannounced guest disturbing and shocking the existing structure. The conjunction of the water and fire signs is treated as the conjunction between the Moon (water) and Sun (fire) which is like amāvāsya and Soma (nectar of life and immortality) is not available for the animal kingdom as the Moon hides in plant kingdom. The exact lunar transit in one kāla (90min) is 0°50’ arc. The Abhukta Mūla doṣa portion of water signs is at 29°10’ to 30°00’ while in the fire signs it is in the beginning at 0°00’ to 0°50’. This view of the Abhukta Mūla as defined by Nārada and Vasiṣṭha is supported by the seers Brahma, Saunaka, while Maharṣi Kaśyapa gives a higher prominence to the gaṇḍānta in Aśleṣā-Maghā and Jyeṣṭha-Mūla as producing serious Abhukta Mūla doṣa while underplaying Revatī-Aśvinī. Brahma defines this Abhukta Mūla in terms of space instead of time. The span of a nakṣatra is 13°20’ (800’) and this portion of 50’ is one-sixteenth (1/16th) portion of the Nakṣatra. In essence, every nakṣatra is divided into four pada of 3°20’ each which in turn are divided into four parts of 0°50’ each. The gaṇḍānta is in the first 1/16th portion of the nakṣatra in fire/odd signs while it is in the last 1/16th portion of the nakṣatra in the water/even signs. These sixteen portions of the nakṣatra are like the sixteen tithī called ṣoḍaśī where 15 tithī manifest and the 16th is śūnya (void). Confusions exist about the definition of the Abhukta Mūla in the definitions based on tie and space. The word Prahara (प्रहर) is defined in jyotiṣa as a fixed period of 3 hours reckoned from sunrise. There are eight prahara in a day of 24 hours and the junctions of these prahara are fixed. In North India these are also referred to as ghaḍī (घडी) meaning ‘the watch’. The first prahara or a day is ruled by the lord of the day and the subsequent follow the order of the kālachakra. 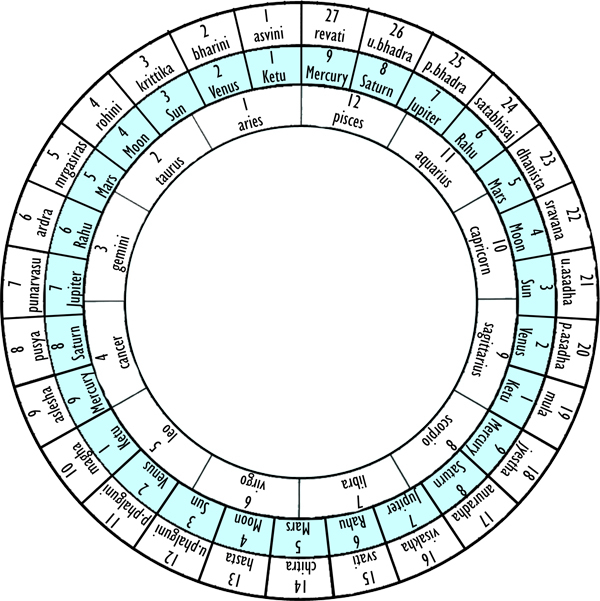 Sun, Mars, Jupiter, Mercury, Venus, Saturn, Moon and Rāhu is the regular order of planets in the Kālachakra. If sunrise is at 6:00’am on Sunday then the starting time for the prahara of that Sunday are – Sun (6am), Mars (9am), Jupiter (Noon), Mercury (3pm), Venus (6pm), Saturn (9pm), Moon (Midnight) and Rāhu (3am). Now, if on that day the Moon was to enter Sagittarius at 5:15’pm, then we can say that it entered Sagittarius in Mercury prahara. Since this prahara extends from 3-6 pm, then according to some views, the Abhukta Mūla of Mūla nakṣatra is merely 45 minutes from 5:15’ to 6:00’pm as the Mercury prahara ends at 6:00’pm. We believe that this is a distortion of the definition of Abhukta Mūla. Brahma has done well to define this in space terms as 50’arc else this unnecessary controversy could have left us with doubts. In the above example, using Nārada and other sages definition, the Abhukta Mūla portion would be in two parts – (a) Jyeṣṭha Abhukta: 3:45’pm-5:15’pm (90 minutes before transit) and (b) Mūla Abhukta: 5:15’pm-6:45’pm (90 minutes after transit). Abhukta means that which cannot be enjoyed or adored. All the sages are unanimous in the opinion that a child born in any of the six Abhukta portions should be given away (for adoption) and taken back after 8 years have been completed. The 8 years refers to the 8 prahara portions that need to be completed [karma results of Moon manifest @ 1 prahara per year]. What is implied is that if this is not done then the separation with the child shall be very painful and severe suffering is indicated. Maharṣi Saunaka concurs and advises that the propitiatory rituals for taking the child back should be conducted on the day of Janma Nakṣatra (which is the gaṇḍānta nakṣatra) when 9th year of the child commences. In the case of Mūla gaṇḍānta (nakṣatra), the first pada birth does not cause evil to father if the birth is in the night. This is because agni tattva doṣa is absent at night just as maṅgalika doṣa (caused by Mars, the ruler of agni tattva) is negligible at night. Similarly, for one born in the daytime, the second pada doṣa of death of mother will not occur as jala tattva doṣa does not manifest strongly for day birth. If the remedial measures are done within one year, then the Abhukta mūla doṣa does not afflict father whereas if it is done within 3 years then mother is safeguarded. The nakṣatra is divided into 15 parts each called tithī-aṁśa and various results are attributed for each part. The effect of the Abhukta spreads to the drekkāṇa (10°) of the gaṇḍānta nakṣatra. Each nakṣatra is 13°20’ span comprising four pada of 3°20’ each. According to most authorities, the effect of the gaṇḍānta junction spreads on either side to 10° (= 1 drekkāṇa or 3 pada). The first three pada of agni rāśi (Aśvinī, Maghā and Mūla) and the last three pada of jala rāśi (Aśleṣā, Jyeṣṭha and Revatī) have flaws.